Former FBI Director James Comey will co-teach a course at William & Mary starting in the fall. Former FBI Director James Comey has a new job. He's going to co-teach an ethical leadership course at the College of William & Mary starting in the fall. This is a bit of a homecoming for Comey; he graduated from the Virginia college in 1982 with a double major in chemistry and religion. Comey is currently scheduled to co-teach the course three times: first in the fall and then again in the spring and summer of 2019. In a statement, Comey said he was "thrilled" to be teaching the course. He said: "Ethical leaders lead by seeing above the short term, above the urgent or the partisan, and with a higher loyalty to lasting values, most importantly the truth. Building and maintaining that kind of leadership, in both the private sector and government, is the challenge of our time." 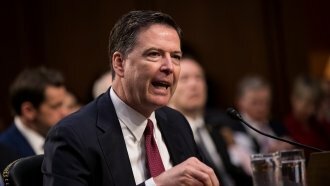 President Donald Trump fired Comey as FBI director last year, claiming Comey had "lost the confidence of almost everyone in Washington, Republican and Democrat alike." This will be Comey's second gig in academia since leaving the government. Last summer, Howard University said he'd give a convocation address and a series of lectures. Protesters repeatedly disrupted his speech in September.